Clarify tasks and responsibilities with work packages. Assigned team members know exactly what to do, and when to do it. Work packages are in synch with the project schedule and can also be linked to Outlook appointments and tasks. Giving feedback about the progress into the project schedule couldn’t be easier. Click Work Packages on the lower left corner of the Projects page that is also a home page. Display work package details Choose one work package from the list and click Open in the Common group. For more information on the Work Package Details dialog box, see Display and process work packages. Book a time tracking entry Choose one work package from the list and click Book Entry in the Common group. For more information on how to add new time tracking entry, see Create and edit a time tracking entry. Mark work package as complete Choose one work package from the list and click Done in the Common group. Open an associated project Choose one work package from the list and click Open Project in the Project group. 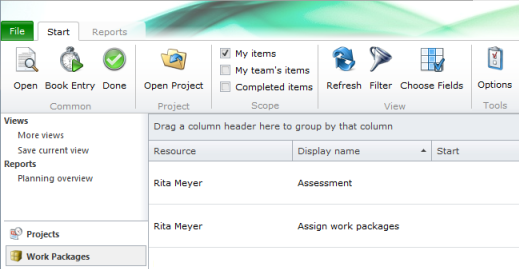 My team's items Displays work packages of all members of projects of which you are manager (*) with state "open" (i.e. to be carried out"). Completed items Displays work packages of all members of projects of which you are manager (*) with state "completed". In order to see all open work packages of the team, the manager should haver read permissions. For more information about read permissions, see Set up permissions. Refresh Via the Refresh button all changes will be updated and the view reloaded. You can find this command in the View group. Search work packages Use the Filter command in the View group to quickly find the needed project. More information can be found under Search and find projects in the Use filters section. Add more information to the work package view This feature sorts and organizes the work package view by selected data. Click Choose Fields in theView group. On the Choose fields dialog box, click one field, e.g. Notification type, and drag it into the column header. Reset the fields via Drag and Drop into the dialog box. Group by one of the column header by clicking on it and dropping to the group field above the columns. Click on column header and drop it to the column headers of the list to reset the grouping. The planning item will be immediately marked with the green check mark in the planning, if you will activate the this work package is completed control box. The context menu provides you with almost all basic features that are also on the InLoox PM Web App Ribbon, such as Open (to open the work package details), Open Project, Done, Book Time. It has also following features to adjust the view: Refresh, Expand or collapse all groups, Filter and Choose Fields. Right-click in the list to open the context menu. Manage the work package view - InLoox • Copyright 1999-2019 © InLoox GmbH. Tous droits réservés.